Long Beach has four miles of beach facing the Pacific Ocean, but it's protected by a breakwater, so there are no waves, so unlike the rest of the Southern California Coast, it's no good for surfing. However, that same lack of surfable waves and the inland waterways of Alamitos Bay make it great for all kinds of other water sports. The activities listed here are all active water sports. If you're looking for someone else to do all the work, take a look at ​LA Boat Tours. Since there are no significant waves, Long Beach is a great place to try your hand at ocean kayaking. For beginners, kayaking through the flat canal around Little Naples Island is even more popular. Stronger paddlers can traverse Alamitos Bay around the big island and over to the ecological reserve or to the Starbucks or restaurants at Marina Pacifica shopping center. 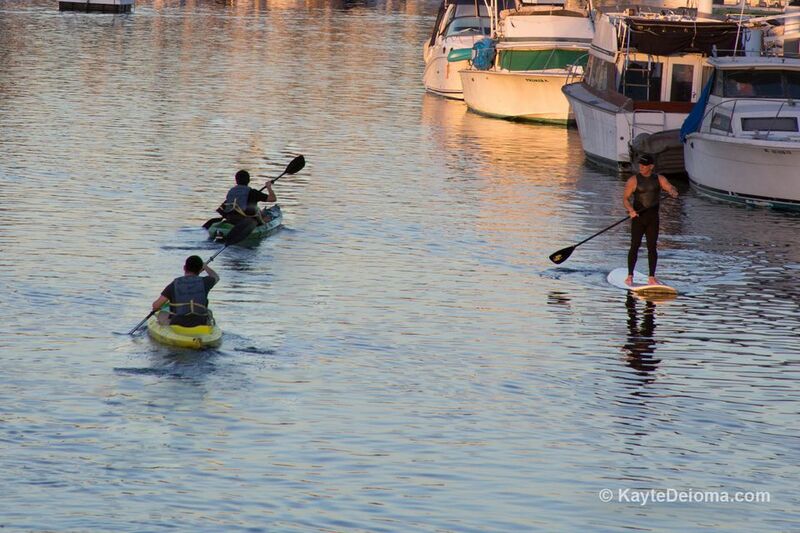 Kayaks are available at Kayaks on the Water on the inland side of the Long Beach Peninsula at 54th Place and Bayshore. There is a little bit of free street parking on the south side of Ocean and on 54th Place, metered parking on the north side of the street and a beach pay lot nearby. On the ocean side, Alfredo's Beach Club rents kayaks at their Alamitos Beach and Belmont Pier Locations. Leeway Sailing Center is a Long Beach Parks, Recreation, and Marine facility down the beach from Kayaks on the Water offering sailing, kayaking, and canoeing classes. After you've taken a multi-week class, you can rent kayaks, canoes, and sabot sailboats. The flat, wave-free water in Long Beach is perfect for stand-up paddleboarding (SUP). 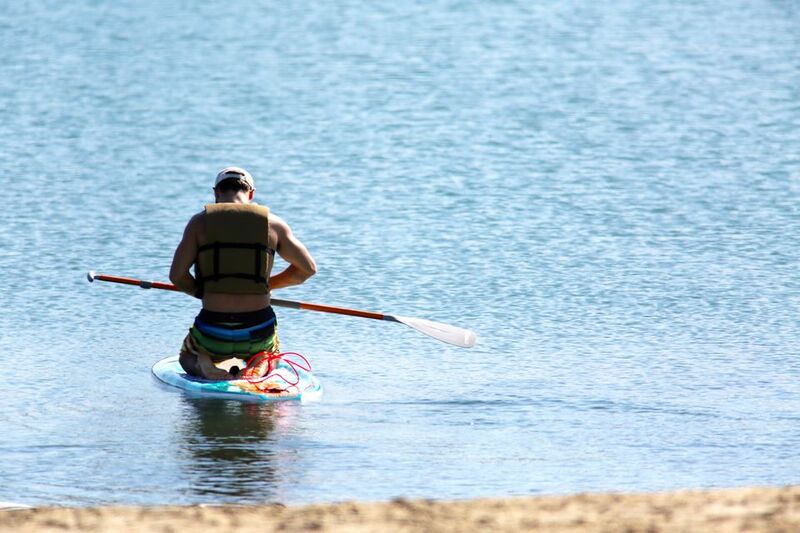 Rental boards and lessons are available from Kayaks on the Water at 54th Place and Bayshore on the beach. You can also rent equipment for delivery to the beach in Belmont Shore from Aloha SUP Rentals. Alfredo's Beach Club rents equipment at their Alamitos Beach location but does not offer lessons. Wheel Fun Rentals offers SUP equipment on Pier 10 at Rainbow Harbor near their Shoreline Village location. Hydrobikes let your ride high above the water, pedaling like a bicycle, and staying pretty dry compares to other human-powered water vehicles. The rental location is on Alamitos Bay Marina, so you can pedal around Naples Island or stop for a beach picnic or waterfront restaurant meal. Long Beach Hydrobikes is located on the dock in front of Khoury’s restaurant at 110 North Marina Drive. Kite surfing, or kiteboarding, is basically surfing with a modified hang-gliding parachute. Since it's more dependent on manipulating the kite in the wind than having waves to surf on, the calm water inside the Long Beach breakwater is perfect for learning the sport. Although you'll see advance kitesurfers up and down the coast, the Kite Zone on Belmont Shore Beach is the only area in LA and Orange Counties approved for kite surfing lessons. On a busy weekend, you'll see dozens of colorful kites in the sky. A few companies offer equipment rental and lessons in the Belmont Kite Zone. Cabrillo Beach in nearby San Pedro is Windsurf Central, but you'll also find windsurfers on inland Alamitos Bay and on the sheltered ocean in Long Beach. Bring your own gear, or you can rent or take a lesson from Long Beach Windsurf Center (3850 E Ocean Blvd) if you happen to find them open. Wave runners, also known by the brand names of Jet Ski, ​Seadoo, and others, are a fun (although loud) way to enjoy being out on the water. They can get you farther, faster than a kayak or pedal vehicle, and require less strength and stamina. You can rent single or double wave runners from Long Beach Boat Rentals in Shoreline Village. Alfredo's Beach Club rents pedal boats for puttering around Rainbow Lagoon, a large pond next to the Hyatt along Shoreline Drive across from the Shoreline Marina and behind the Long Beach Convention Center. Rainbow Lagoon is a popular location for music festivals and food festivals. Like a superhero with a jet pack, you can soar over the ocean propelled by jets of water under your feet. The water jets, powered by a hose attached to a wave runner, allow you to maneuver almost 30 feet in the air. Expert jet-boarders also learn the dolphin dive, using the jets to propel themselves in and out of the water like a dolphin leaping. Fly Jet on Alamitos Bay in Long Beach will teach you how it's done, with test runs starting at 15 minutes. Note: This is similar to Jetpack or Jetlev, but the water jets are under your feet instead of shooting from a backpack. Long beach is a departure point for dive boats diving sites from local shipwrecks to Catalina Island. You can join a scheduled dive or book a private charter for your group. If you already know how to sail, boat rentals are available, or if you're a beginner, you can schedule lessons at locations at Rainbow Harbor, Alamitos Bay and Harborlight Yacht Club near the Queen Mary. Sport fishing excursions are available from multiple companies at Alamitos Bay Marina, Rainbow Harbor, and on the Inner Harbor at the Port of Long Beach at the south end of the 710 freeway.